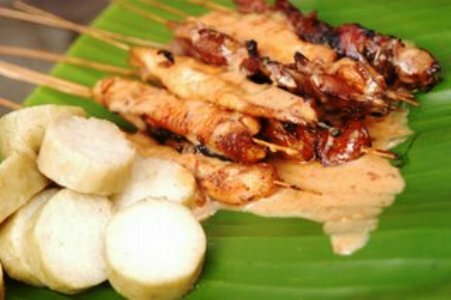 Who does not know Satay? It is a pop­u­lar dish that many peo­ple like. Either lux­u­ri­ous hotels or stalls on the sidewalk pro­vide this dish, either eaten directly from the grill or as a dish served with rice or lon­tong (wrapped rice). I am wondering why Satay has not been a favorite dish as it should be .I have hope that Satay, one day will enjoy the same status as Sushi as the Japanese has promoted. 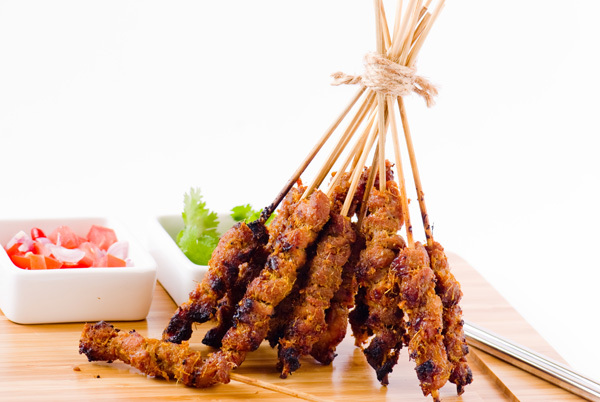 Satay has been one of my favorite dishes since my childhood……. When I was a young girl, I remembered my mother often took me and my sisters to a famous noodle shop which located side by side with a satay stall. While both my sisters chose a bowl of chicken noodle with meatballs, I preferred to have chicken or mutton satay with lontong (wrapped rice). To me, there’s nothing more sataysfying than satay fresh off the grill, when the skewers of the seasoned meats are hot, juicy, and infused with the flavor of smoldering charcoal. 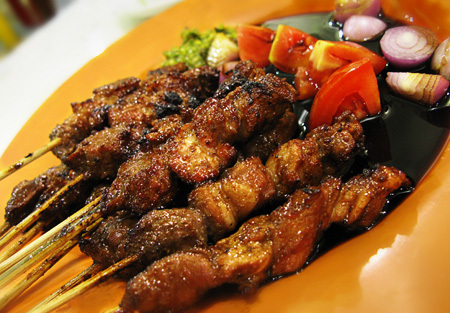 Known as sate in Indonesia, my country is the home of satay, and it is a widely renowned dish in almost all regions of Indonesia and is considered as the national dish. It is served everywhere from street carts to fine dining set up, as well as in homes and at public gatherings. As a result, many variations have been developed throughout the Indonesian Archipelago. 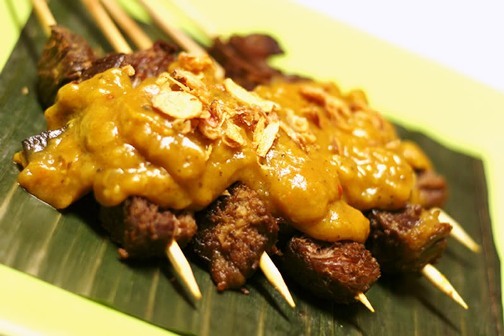 The satay variants in Indonesia usually named after the region its originated, the meats, parts or ingredients it uses, also might named after the process or method of cooking. Cut the chicken into 1 x 1 x 2 cm cubes. Skewer 3-4 cubes of chicken fillet on each skewer. To make the satay sauce, combine the red chillies, shallots, and garlic. Process in a liquidizer or grinder into a fine paste (add water if necessary). Heat 3 tbsp cooking oil, stir-fry the chili paste until fragrant. Add the ground peanuts and water. Stir to blend. Add the sugar, salt, and sweet soy sauce. Cook on a low medium heat until oil separates. Add the lime juice, leave to cool. 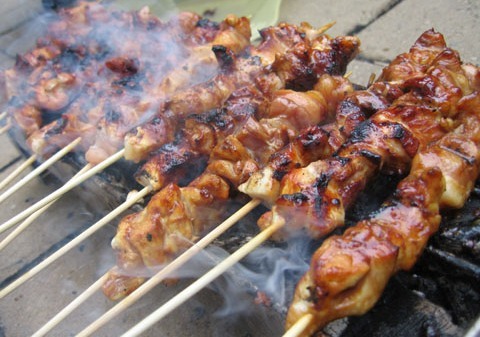 To grill the satay, mix 3 tbsp of peanut sauce with 2 tbsp cooking oil and sweet soy sauce. Use it to season the satay before grilling. Grill satay until done. Serve the satay with the remaining satay sauce. Mix all ingredients in a bowl and marinade for couple of hours. Arrange the meat in a sate skewer (3 meats in one skewer). A dish from Padang and the surrounding area in West Sumatra, which is made from cow or goat offal boiled in spicy broth then grilled. Its main characteristic is a yellow sauce made from rice flour mixed with spicy offal broth, turmeric, ginger, garlic, coriander, galangal root, cumin, curry powder and salt. 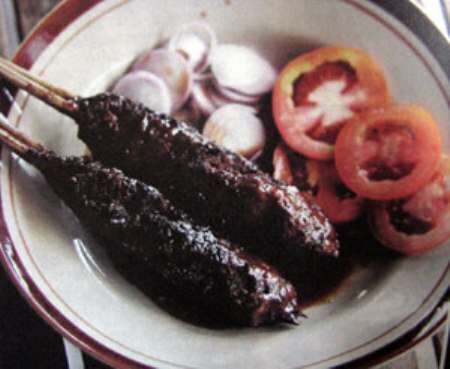 A variant of satay originating in Ponorogo, a town in East Java. It is made from sliced marinated chicken meat, and served with a sauce made of peanuts and chilli sauce and garnished with shredded shallots, sambal (chili paste) and lime juice. 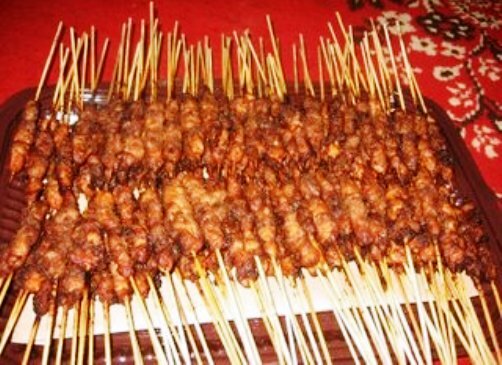 This variant is unique for the fact that each skewer contains one large piece of chicken, rather than several small slices. A specialty from Solo in Central Java. It’s made from minced beef or mutton (especially meats around ribs and belly area). The minced fatty meats are wrapped by thin fat or muscle membrane and wrapped around a bamboo skewer. The size of this satay is quite large, very similar to a middle eastern kebab. After being grilled on charcoal, the meat is separated from the skewer, cut into bite-size chunks, then served in sweet soy sauce and pepper. 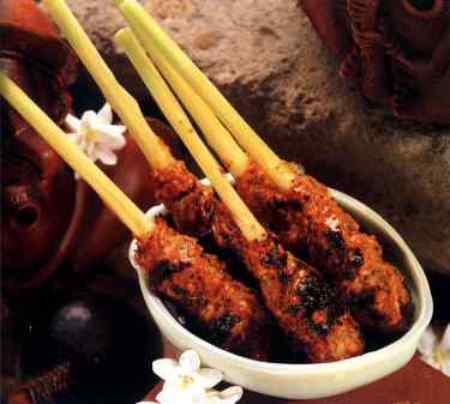 Pork satay with galangal is popular among the Indonesian-Chinese community. This dish can be found in China towns in most Indonesian cities, especially around Glodok, Pecenongan and Kelapa Gading in Jakarta. It is also popular in Bali which the majority are Hindus, and in The Netherlands. 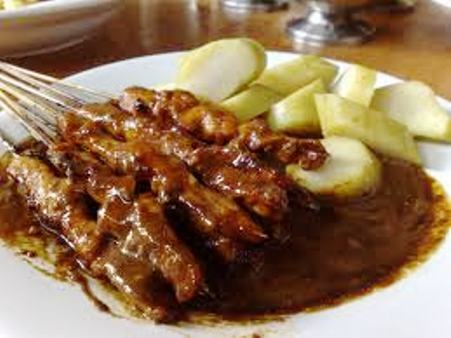 This entry was posted in My Food-o-pedia and tagged favorite childhood dish, mother, postaweek2011, satay, satay Madura style, satay-sfaction, satay-sfying, sate ayam, sate babi, sate kambing, sate lilit Bali, sate Padang, sate Ponorogo. Bookmark the permalink.